Did you know that air-conditioning has been around for centuries in Europe, long before the invention of electricity? It’s true. Well, sort of. 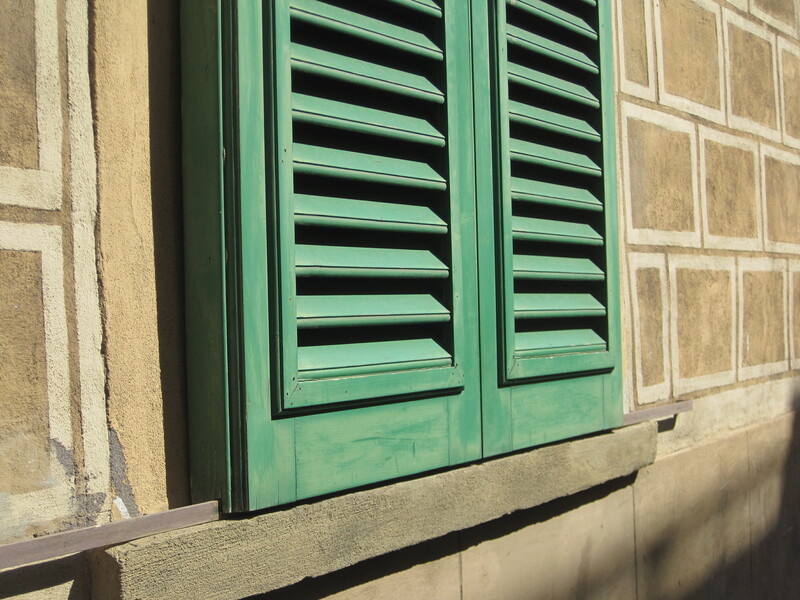 Europeans are experts at using exterior shutters to control the flow of air and the intensity of the sun, thereby conditioning, cooling the inside spaces. It costs nothing to run their state-of-the-art air-conditioning system. That clever invention has been in use for millenia now, and nobody can top the original idea. Even though the Italians didn’t invent the shutter, (the Greeks did or maybe even the Persians since they are called persiane) they have certainly perfected the art of “shuttering” with attention to detail, and figuring out how to make those little window covers work like a charm. In doing so, they became the original “window unit” air-conditioners. 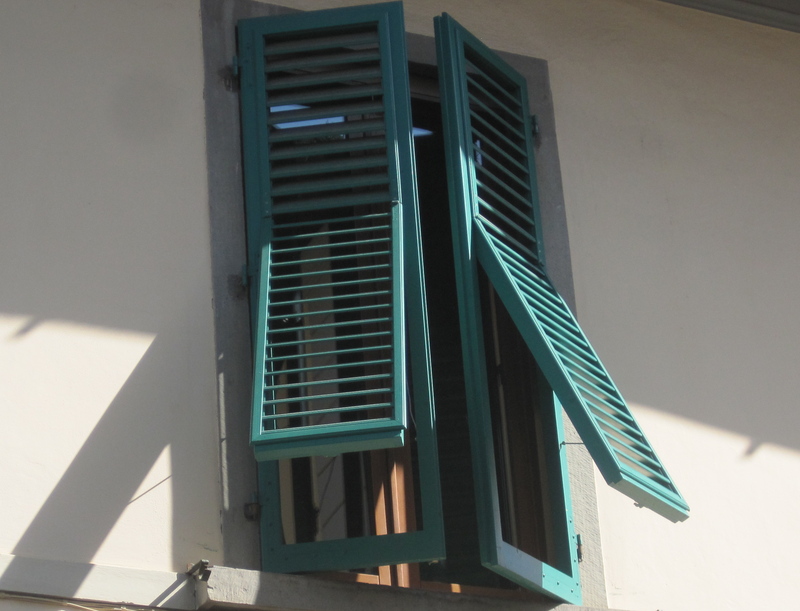 Here’s our over-simplified explanation of the evolution of shutters as air-conditioners. 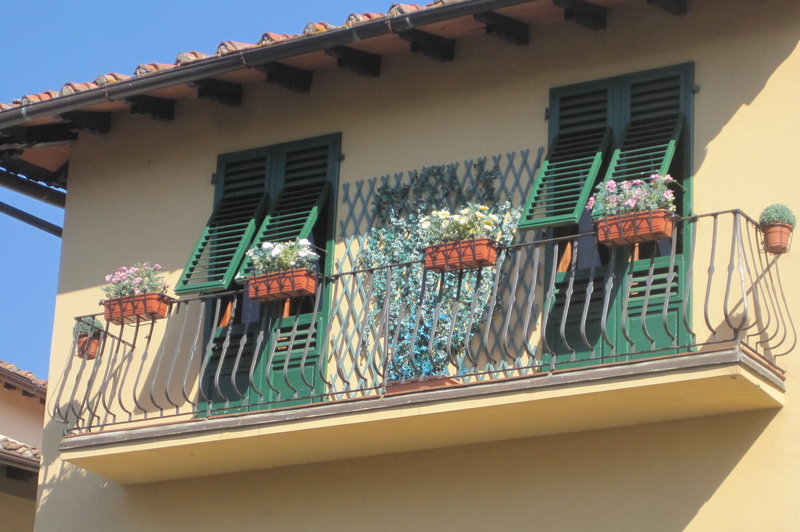 First, Italians instinctively decided to put shutters on every window. Good start. 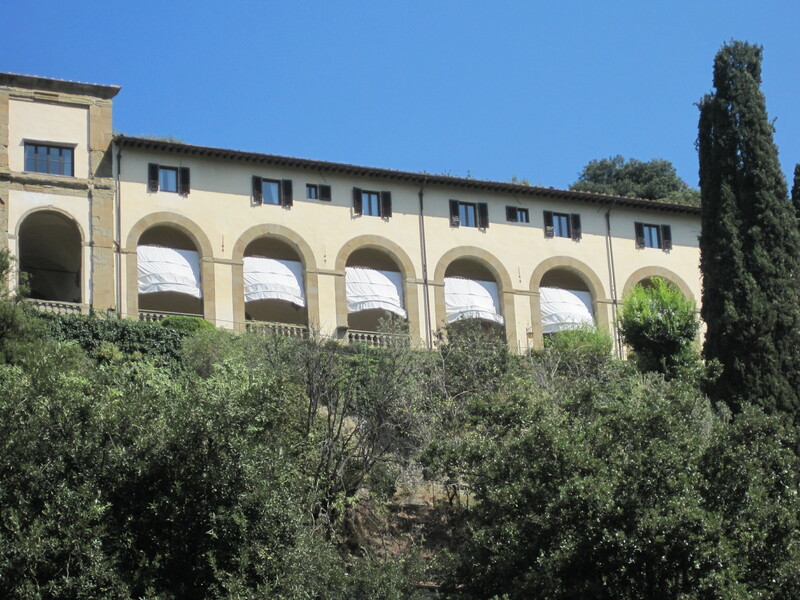 Then, in the mid-1500s, Michelangelo entered the scene and took the notion of a simple shutter to new heights with the perfection of the beautifully expansive Italian loggia. (Think of a great front porch.) Perched high up on the hillside, those artistic, open, shaded spaces allowed cool breezes to surround and insulate the inner sanctum of the villa. 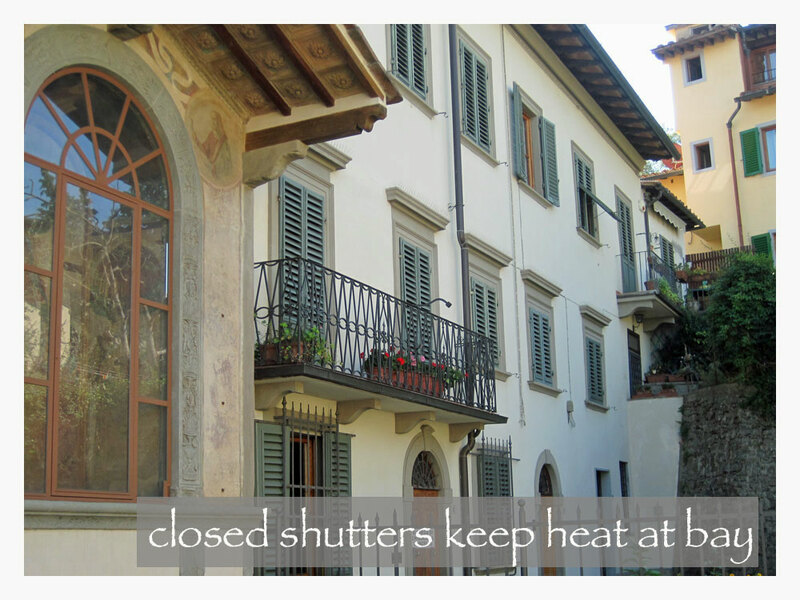 But rather than eliminate the need for shutters, they were more important than ever, functioning as the original regulators or “thermostats,” allowing delicate adjustments to the overall “climate control system.” It was a masterpiece of comfort and delight. Brilliant! The advent of this early form of air-conditioning wasn’t solely for the wealthy. No. The persiana, shutter and the loggia (at least a balcony), found their way into the hearts and homes of all Italians, whether living in the country or in the historic centers. The balcony-shutter combo became a way of life. Adjusted in a variety of ways, shutters certainly sweetened il dolce vita, the good life. Shutters are indeed versatile: they swing 180˚ to follow the sun; louvers move to maximize the air flow; inset panels kick out, so the shutter can be simultaneously open yet closed at the same time; some are designed to lay flat against the wall when open, while others slide along the face of the wall to keep from smacking passers-by in the head; they can also be locked tight to keep everything out. 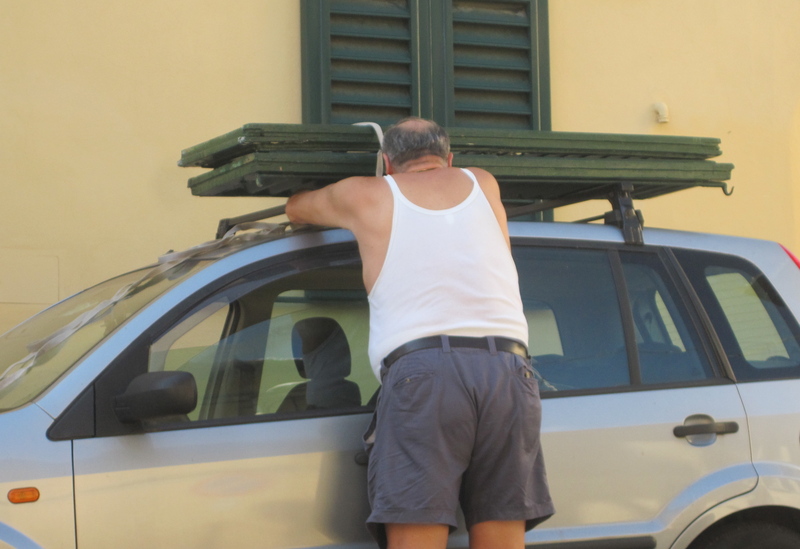 In the picture to the right, we see the proud owner of a new air conditioning system—or could it be a make-shift car air-conditioner? Well, at least you can look “cool” driving around town. So, we practice the fine Italian art of shutter shifting. We remain alert to the location of the sun and the direction of the prevailing breezes. With those two bits of information we adjust all of our “window units” into a veritable choreography of cool relief from the searing August heat. In addition to the actual coolness, there is also the sense of coolness inside, since the rooms are moodily dimmed. Talk about “peak efficiency.” It is indeed a vision to behold, when we walk through town streets and see the “dynamic” regulator/shutters, doing exactly what is needed at the moment to ensure the comfort of the people inside. After visiting 34 countries, Italy stills holds first place for my favorite country in the world. What a beautiful life it must be to live there and experience the culture first hand. We look forward to hearing your comments as this tale of first hand experience unfolds. I love your precision, wit, and insight with which you describe the simple beauties and workings of Italy.